As part of the commemoration, Kevin appeared on several media interviews, including USA Today, Corpus Christi Caller-Times, KIII-TV, and KRIS-TV. Kevin shares his story of that fateful day when the huge grain elevator he was working at exploded, causing massive loss of life, and almost ending his own. After spending a year in the hospital, Kevin was left paralyzed completely from the chest down. Kevin was only 23 years old and working as a USDA federal inspector on April 7, 1981. He had conducted a safety inspection the day before the blast occurred. In an interview with the Corpus Christi Caller-Times, he said, “When I went through the safety check on that Monday, I found the dust collection system wasn’t working. I told my supervisor, and together we reported the failure to the head engineer of the Port of Corpus Christi. After our meeting, he said he would take it back to his bosses to see about fixing the dust collection systems. All of us were aware of the danger of a non-functional dust collection system. While grain itself isn’t explosive, any movement of the grain in the silos creates grain dust, which is a highly flammable when suspended in the air. In fact, grain dust is more explosive than dynamite or gasoline – approaching atomic energy based on the tremendous force created in a grain dust explosion. That inspection should have triggered an immediate shutdown and repairs. Instead, it was ignored with fatal consequences. If either the dust collection system had worked, or the employee had opened the can in a safe manner, the explosions through the facility may have been avoided. Instead, it instantly triggered a deadly chain reaction of 12 explosions ripping through the grain elevator with each explosion becoming more powerful. The biggest explosion blew Kevin through the roof of the two-story building he was in. He would fly over 300 feet through the air, landing hard on a concrete parking lot, crashing down on his head and shoulders, crushing the back of his skull and shattering his scapulas. Paralympian Kevin Saunders signed an autograph to “Mission Impossible” star Tom Cruise while working on the 1989 Oliver Stone film “Born on the Fourth of July.” Kevin also became one of the top keynote speakers and motivational coaches across America, with a mastery in topics including peak performance, workplace safety, fitness and education. (Left) picture like Kevin signed for Tom Cruise, when he asked for Kevin’s autograph. Kevin wrote “GO FOR IT! 110% Then when Kevin asked Tom for his autograph he had his brother who was his assailant at the time and Tom wrote for Kevin GO FOR IT 200%! He later explained to Kevin during shooting of the film he had always wanted to be a great athlete but never reached his goal. So when he got the opportunity to be in a movie he was not going to let success get away from him as an actor. The 200% was Tom’s way of saying “Double Your Efforts” and you’ll be successful! From there, Saunders launched himself into the world of athletics that he never knew existed. Like Kevin says: “We always tell our student-athletes at Kansas State football (Big XII) Conference – “That you don’t know, what you don’t know!” Kevin didn’t know anything about wheelchair sports after being an athlete on his feet and then spending almost a year in the hospital recovering from his massive internal and external life threatening injuries. 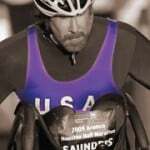 After he first got involved and had some success on the national and international levels, it opened many other doors to find success in his new life – completely paralyzed from the chest down and confined to a wheelchair. (Left) Kevin throwing the discus in the Paralympic in the Olympic stadium. (Center) Kevin raises his arms in Victory. (Right) One of Kevin’s USA Kappa uniform and a few medals and awards he has won in America and worldwide. (Left image) Kevin coming in first in lane 2 in the Paralympics. (Right image) Kevin with Franco Columbu (far left) who has won World body building titles and won the Mr. Universe and Mr. Olympic numerous times. Joe Weider (back, center) – a body building Champion and creator of Mr. & Miss Olympia Contest. He was well known for his fitness-related magazines, most notably Muscle & Fitness, Flex, Men’s Fitness, Shape, and many more. Fritz Fisher CIA (back, right) and Leah Buikstra (front, right). They here all attending a President’s Fitness Council dinner in Washington D.C.
Kevin Saunders was the first person with a disability to be appointed to the President’s Council on Physical Fitness and Kevin also had the honor of serving multiple terms for three US Presidents. Kevin became life-long friends with former California Governor Arnold Schwarzenegger. 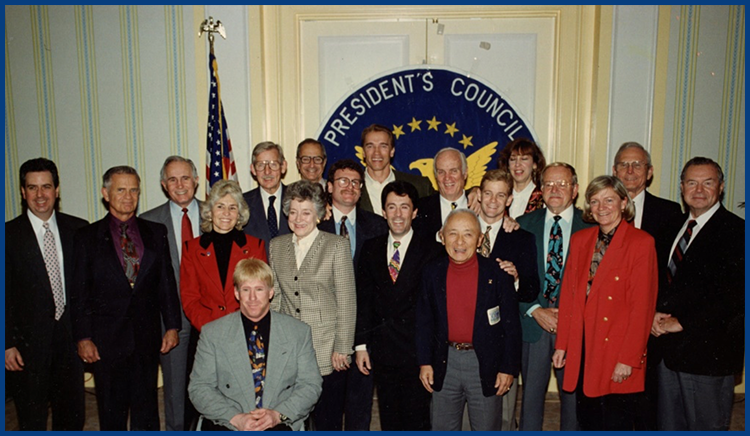 Kevin is seated in front and Arnold is standing in the back row and center, in front of the round President’s Council banner. Kevin also became one of the top keynote motivational and safety speakers, driven by a passion that grew from his desire to help others achieve their goals. Kevin says every anniversary of the Public Grain Elevator Explosion serves as an important reminder of a safety first attitude. (Left) Kevin speaking to a large audience at a lecture series. (Right) Kevin giving a motivational speech to several thousand people at a conference.